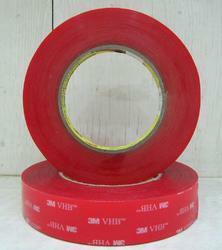 Voted as first among the best, we are engaged in rendering the best quality of 3M VHB 4910 Clear Tape. Their rich attributes such as elegant design, high adhesion, cohesion and holding power make the clear tapes highly demanded. Designed by using modern machinery, the tapes leave no residue on surface when removed due to specially formulated adhesive.